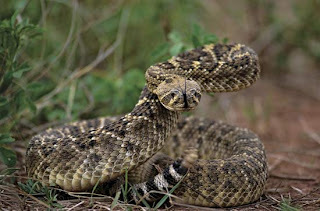 An aggressive and easily excitable rattlesnake, the western diamondback is responsible for more snakebite deaths than any other in the country. 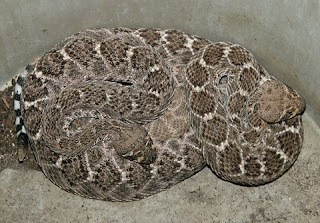 It is also the largest rattlesnake in California, measuring 34-83 inches in length. It has a plump body, a short tail and a broad, triangular head. Its heavy body has dark diamond shaped blotches with light borders. There are twp light diagonal lines on the side of its triangular shaped head. The base of the tail is encircled with white and black rings. It can be yellowish grey, pale blue, or even pink in color. Mating begins in spring after the snakes emerge from their winter hibernation. Copulation lasts for several hours, with several resting periods. Gestation lasts for 167 days, at the end of which the 4-23 young emerge from their eggs prior to birth and are born live, 8-12 inches in length. They stay with their mother for only a few hours and then set off on their own. The snakes will reach sexual maturity after 3 years. They have been known to live 27 years in captivity. The western diamondback is found throughout the southwest. In California, it is found in desert regions, including open desert, rock canyons and hillsides. The snake eats rodents, birds, lizards, and even fish and invertebrates. They hunt using their tongue to sense chemicals left by prey and their pit organs to sense variations in heat. The western diamondback is preyed upon by hawks, bald eagles, roadrunners and wild turkeys. The Western Diam ondback Rattlesnake, or Crotalus atrox, a member of the family Viperidae, the subfamily Crotalinae, and the genus Crotalus, has such a hold on the human psyche that it has been a symbol of the American Southwest from prehistoric into historic times. It figures in ancient mythology, ceramics and rock art and in modern story and media. 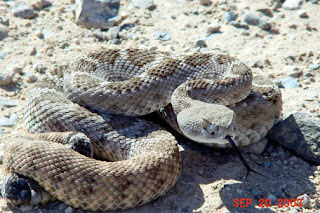 The Western Diamondback, which can exceed seven feet in length, is the king of our twenty odd species and sub-species of Southwestern desert rattlers, not only in terms of size, but also in terms of its fearsome reputation. Like its brethren – a clan of some 100 species of poisonous snakes generally called "pit vipers" – the Western Diamondback comes equipped with a spade-shaped head, a fiendish fang and venom system, elliptical pupils and heat-sensing facial pits. It has reserve fangs to replace any which break off in a victim. 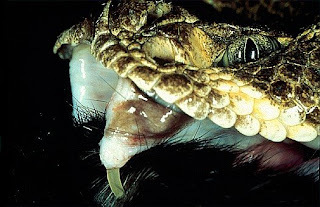 The venom causes extensive tissue damage, bleeding and swelling in humans. The pits, in effect, infrared detectors, guide the snake swiftly and surely to warm blooded prey such as rodents, even in the total darkness of the animals’ burrows. 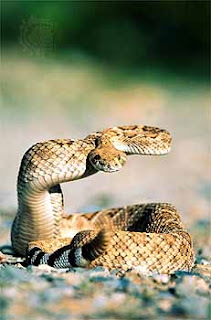 Its rattles – a distinguishing feature it shares only with other rattlesnakes – grows segment by segment, each rattle the keratin remnant of a shed skin. It can add two or three rattles each year, with each molt, although it may also break off some of its rattles in the course of a year. 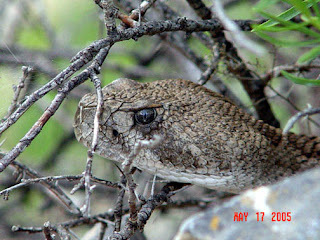 The Western Diamondback male, like the males of most species, become obsessed with females at mating time, in the spring. He pursues the female incessantly. Should he encounter another male, the two will wrap around each other in a serpentine wrestling contest, rearing and falling and body slamming until one or the other concedes defeat. Once inseminated, the female, sexually mature at three years old, will bear her brood live, in late summer. The young are born complete with fangs and venom, armed and dangerous at birth. A good thing, the mother abandons them upon delivery. With the coming of the shortening days and falling temperatures of autumn, the Western Diamondbacks head for the community den – a cave or rocky recess – where they will hibernate for the winter. In colder areas, they come by the hundreds; in warmer areas, by the dozens. They emerge in spring, sexually driven, hungry and mean. 1. The Western Diamondback always rattles to warn a victim. 2. The snake rattles to dispense a poisonous dust into the air. 3. It can charm a bird out of a tree. 4. It imprints its appearance on the fetal child of a pregnant woman. 5. It can grow to be ten or even twelve feet long. 6. It swallows its young to protect them from harm. 7. It will not crawl across a horse-hair rope. 8. Its venom, flesh, skin or rattles can cure various human diseases and wounds. 9. Its eyes, clouded by a loosening skin prior to shedding, impair its vision. 10. It can live for more than twenty years. 11. Its age corresponds to the number of its rattles. 12. Its venom can retain its potency for years. wow.. it`s very cool pics..
king cobra here, with neurotoxic venom the same venom as rattlesnake, but it's more dangerous. be save our world fom global warning..
Gracias por tú visita . Qué interesante es tu blog , me gusta mucho . bahasa postingnya ga faham , yawdah nikmati hasil foto2nya ja. keren tuh bidikannya!! Foto-foto... siapa mo foto sama ular? ?